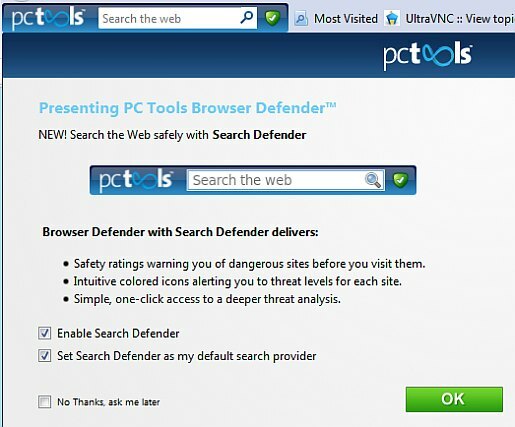 PC Tools Antivirus Free 2011 was just released today. The software is the main antivirus program that is provided by Google Pack. The software is also recognized as being lightweight and very efficient. Some of the new features include integrated ThreatFire community zero day protection (I believe a first for a free antivirus ) a global action list to block certain activities, an updated interface, and more. Upon starting the antivirus, a user will notice that the whole interface has been upgraded significantly. While PC Tools has decided to keep the original background of the previous versions. The status of the antivirus is prominently displayed. Large icons depict that both the scan now and intelliguard are active and protecting the system. However, one annoying thing is that the advertisements to upgrade to the full version are also more prominently displayed. There are also is a box that flies across the screen telling a user about an upgrade. However, PC Tools needs to make their money somehow and at least the software doesn’t prompt the user on every reboot about the fact that they are only running a free version (a.k.a. Bitdefender Free). Also, the software automatically schedules scans to run every other day. As stated above, PC Tools has significantly beefed up the functionality of PC Tools Free Antivirus. The first huge antivirus technology update is the inclusion of ThreatFires Zero Day community based antivirus. This feature is identical to Norton Insight and other variants in that it utilizes all active PC Tools users antivirus programs. Every PC acts like a detector and alerts all other user about its detection history and heuristics. 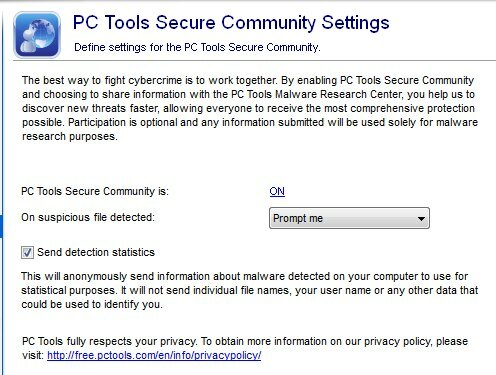 This means that the collective information will allow PC Tools Antivirus Free 2011 to proactively block threats. The next updates are small yet important. The first is the ability to scan alternative data streams or essentially rootkit detection technology. This again is offered in very few “free antivirus”. Next, is the global action list. This list allows the user to define a website or file that a user wants to block or always allow. This is helpful if PC Tools Antivirus Free 2011 identifies a false positive and a user can then unblock that file from being constantly detected. In addition, if there is a bad website or file a user can block that as well. Finally, there is a background idle scan technology that does basically what it says. If the computer is idle, the computer gets a virus scan; sweet. The performance of the virus scan has vastly improved. The inteli-Scan completed in a ridiculously fast 12 seconds (utilizes a memory scan) and utilized only 40 megabytes and about 13 percent CPU power. There is also a new check box that a user can select and allows PC Tools Antivirus Free 2011 to use an autofix functionality. A full system scan took about 1 hour and the memory usage swelled to about 70 megabytes and CPU usage still remained at about 13 percent (still a very reasonable amount). The virus scanner is really fast. According to Windows Resource Monitor, I was getting sustained disk activity from 7 megabytes a second up to 23 megabytes per second. One thing that’s also nice is when one pauses the scan, it actually stops. Most free antivirus require a wait time of at least 15 seconds before the scanner can stop. In terms of detection, PC tools didn’t detect any viruses or false positives on the test system. The antivirus is certified by all major test labs and provides benchmark protection. Also, the updates now show within the last hour whether they were updated indicating a new pulse update feature? Even though the interface has been updated the usability of the GUI is generally the same as before. I always do a few things when configuring PC Tool free antivirus. The first thing is I navigate over to the file guard in the intelliguard setting and select File Guard. The original setting is only for “process and executables”. However, one should change this setting to “All files and Processes”, which will make PC Tools identical to other mainstream antivirus programs. In addition, one will want to select allow “Intelliguard to detect potentially unwanted products” and finally change the smart update to “download and install updates silently”. If one has a fast computer they can also select “run a scan on startup”. In conclusion, PC Tools Antivirus Free 2011 is an excellent antivirus and now comes with more features than the competitors. What does this mean for the consumer? Only better and more attractive free antivirus to come!